On my trip home to Denmark, my talented sister-in-law Mette made this delicious couscous salad for me with baked potatoes to go along. YUM! I was in heaven! I have replicated it once before, after my trip earlier this month. Today, I wanted to celebrate 21 Celsius weather, so this dish seemed absolutely perfect! 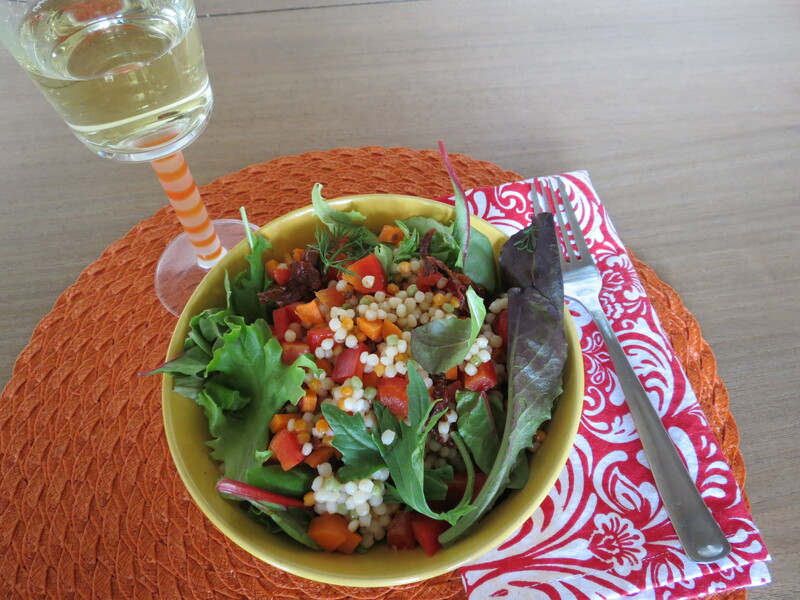 First, I cooked up a cup of Bob’s Red Mill Tricolor Pearl Couscous aka Israeli Couscous. Seriously, this only takes 10 minutes to make! Easy peasy! Then I added a whole red bell pepper (sliced & diced), two carrots (finely sliced), and then some sun dried tomatoes. For dressing, I used Annie’s Lite Raspberry Vinaigrette.